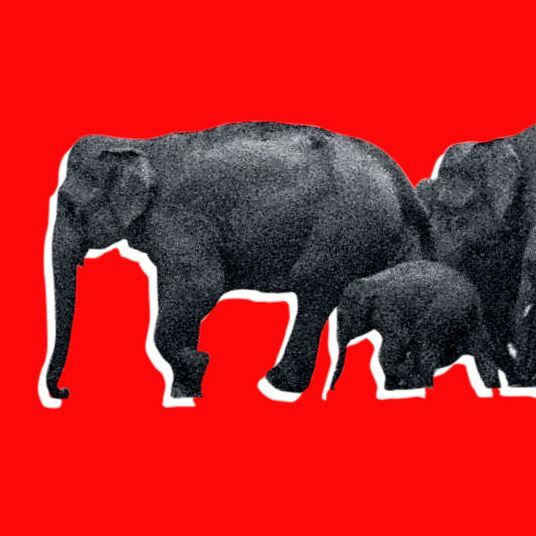 The political news this week is being dominated by reports of elephants breaking away from the herd: Republicans who are not supporting Donald Trump for president. They are most often being differentiated by exactly what they are saying or not saying: Some are simply refraining from opportunities to endorse their nominee; some are publicly refusing to endorse their nominee; a few are going to vote for the Libertarian or a last-minute conservative independent or write-in candidate; and a steadily increasing number are going over the brink to support Hillary Clinton, as one might expect with Election Day fast approaching. There’s no telling when the exodus will end; the latest Trump outrage, about “Second Amendment people” having some plans for HRC, is creating a fresh bout of heartburn for exasperated Republicans, and could send a new batch toward the exit ramp. 1. Nominal Republicans who are out of synch with their party: While they are not as plentiful as they were in the days when liberal Republicans and conservative Democrats walked the Earth, there are always some nominal partisans available, often long in the tooth, who object to the general direction of “their” party and can be rounded up to show their displeasure with a statement of dissent or a cross-endorsement. This used to be a particular cross to bear for Democrats, from the days of John Connally’s Democrats for Nixon in 1972 to Joe Lieberman’s active support for John McCain in 2008 — but Republicans are catching up. Former South Dakota senator Larry Pressler is a good example of this breed of errant pachyderm. He endorsed Barack Obama twice, attempted a Senate comeback as an independent in 2014, and has now endorsed Hillary. But my favorite defector of the cycle has got to be former Michigan governor William Milliken, who endorsed Clinton as a protest against Trump’s candidacy. Like Pressler, he’s a serial defector; he endorsed John Kerry in 2004, and de-endorsed John McCain late in the 2008 cycle. But to grasp how out of touch the 94-year-old Milliken is with the contemporary GOP, consider that he became governor of Michigan when George Romney resigned to join Richard Nixon’s cabinet. Enough said. 3. Political realists. There are also Republican defectors who seem to be motivated by cold political calculation. Most obviously, Illinois senator Mark Kirk’s slim odds of reelection almost certainly depend on winning a lot of votes from people who loathe Trump. But even his Senate colleague Susan Collins, who is being treated today as a brave woman of principle for refusing to get on the Trump Train, could be thinking about her political future in Maine, where according to Hohmann she could be contemplating a gubernatorial run as an independent. More famously, Ted Cruz is clearly calculating his “vote your conscience” statement at the Republican convention will look infinitely better if and when Trump goes down to a catastrophic defeat, leaving his own self as the front-runner for 2020. John Kasich and Ben Sasse could be making similar calculations about their political futures. 4. Redundants. In many respects the most sympathetic group of Republican defectors are former environmental, immigration, and trade-policy officials who obviously have no place in a party led by Donald Trump. I mean, really: Let’s say you are Robert Zoellick, once George W. Bush’s United States Trade Representative. Trump is accusing you and people just like you of deliberately selling American workers down the river and destroying the country in close concert with the godless Clinton administration globalists in the other party (on top of that, Zoellick ran the World Bank and worked for Goldman Sachs!). Are you going to blandly endorse him or fight to win “your” party back? It’s a pretty easy call. The same is true of Republicans closely identified with comprehensive immigration reform and strong environmental regulation (e.g., former EPA director Christine Todd Whitman, who has indicated she will vote for Clinton). 5. Assorted elites. For most of the rest of the elite defectors, the emphasis should be on the word “elite.” They are mostly former appointed officials in Republican administrations who have since moved on to life in that floating stratosphere of policy mavens, think tankers, lobbyists, and Cabinets-in-waiting. They are heavily found on that list of 50 Republican foreign-policy experts calling for Trump’s defeat. Some are actually “redundants” associated with past Republican policies Trump has denounced (you can add the Iraq War to the list above). Others know there is no way they will have a place in, or even access to, a Trump administration. Still others simply have a reciprocal assessment of Trump as a loser. They are mostly sincerely angry about what is happening to their party, and plan to have a future role in the GOP when the “fever” has broken. What they all have in common is that they will never, ever have to deal with Republican primary voters, other than at a safe distance. The key question to ask with all five groups of Republican defectors is whether they represent a significant group of rank-and-file Republican voters, who have for the most part been more likely to stick with Trump than elected officials and other elites have been. That’s not the only measurement of the value of defectors; sometimes independent voters can be swayed by these kind of negative testimonials for a major-party candidate, and there are financial considerations as well, since wealthy donors prefer some cover before abandoning a party nominee. But it will be interesting to find out whether the party has truly left the defectors behind, or if instead they are simply a party-in-exile that will hold the reins long after Donald Trump has left politics like a bad circus leaving town.